Cook caught 112 passes for 1660 yards (14.8 avg.) and six touchdowns in three varsity seasons and received first-team All-American honors from UPI and the American Football Coaches Association in 1988. He was chosen by the Patriots in the third round of the 1989 NFL draft and saw scant action as a rookie due to a broken foot, catching three passes and performing well on special teams. 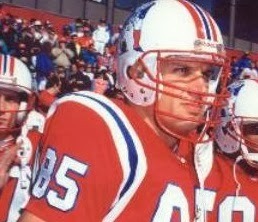 Cook became the starting tight end in ’90 and broke out with 51 receptions for 455 yards (8.9 avg.) and five TDs. Patriots went 6-10 to finish fourth in the AFC East. The overachieving Cook followed up with 52 catches for 413 yards (7.9 avg.) and two TDs in 1992 and was again chosen to the Pro Bowl. His production dropped off in ’93 as Ben Coates saw more action at tight end and he was let go by the Patriots. Cook moved on to the Chicago Bears in 1993 and finished his career with the St. Louis Rams in ’94, catching 47 passes in his last two seasons for 347 yards and two TDs. Overall, Cook caught 257 passes for 2190 yards (8.5 avg.) and 13 TDs, with 210 receptions for 1843 yards and 11 TDs coming with the Patriots. He was a consensus first-team All-NFL selection once and was chosen to two Pro Bowls. Cook went on to become a high school football coach whose teams have won six straight Iowa state championships at the Class 1A or 2A level.